The value of hyperconverged infrastructure is well understood for running primary workloads. Cohesity is extending the benefits of HCI with a platform designed to eliminate secondary storage silos by converging all secondary data and associated data management on one unified solution – including backups, files, objects, test/dev copies, and analytics data. Join us in this session to learn about the Cohesity solution and its benefits in your environment. Gaetan Castelein, Head of Product Marketing, Cohesity. Experts from Pure Storage and Cohesity will discuss the industry’s first all-flash, scale-out file storage, purpose-built for high-performance and immediate access to mission critical file and object data. Pure Storage FlashBlade provides unparalleled performance across a broad range of environments. Cohesity, the leader of hyperconverged secondary storage makes your data work for you by consolidating secondary storage silos onto a web-scale data platform that spans both private and public clouds. Meet Cohesity CloudSpin, a new feature on our DataPlatform that accelerates your test/dev initiatives in the cloud! Secondary data operations such as backup, file & object storage, copy management and DR have become cumbersome, expensive and ultimately risky due to complex infrastructure that hasn't seen true innovation in decades. Watch this on-demand webinar to see how Cohesity is bringing Google-like design principles such as web-scale, hyperconvergence and native cloud integration to a new platform that's been specifically designed to address the needs of secondary data and apps. Join Howard Marks of DeepStorage for a report comparing the Direct Recovery of a virtualized application environment utilizing Cohesity's software-defined converged solution versus a typical, built from scratch Veeam Backup and Replication system. Howard will also explore emerging trends in the data protection industry and explain why convergence and recovery time are important considerations in choosing your next data protection solution. Additionally, Aaron Delp will explain the concept of scale out and what comes after. Cohesity DataPlatform is a recognized data protection and recovery solution for VMware vSphere and VMware Cloud Foundation, which has proven to be much more than JUST backup. Watch this on-demand webinar to find out how Cohesity DataPlatform provides enterprises with the ability to maintain visibility of their data and more. It's your job to protect your company's data (and even your personal data) but with malicious attackers trying to access that data and even ransom that data, keeping your company's data is getting tougher every day. Watch this on-demand webinar to learn more about how Cohesity provides enterprise data protection for Pure Storage FlashBlade with Cohesity NAS protect. Join Aaron Delp, Director of Technical Solutions Marketing at Cohesity for a report explaining the state of today’s storage and the need for its modernization, Cohesity’s unique architecture for DP and DR, a brief summary of a customer success story, as well as the next steps for Cohesity. Join us to see how Cohesity consolidates data protection, secondary data, and associated management functions on one unified web-scale solution. Cohesity’s Aaron Delp, takes a closer look at the distinction between primary and secondary storage, and what’s below the tip of the storage iceberg. In this webinar, you’ll hear about how we’re tackling fragmented, inefficient dark data, along with how our customers are utilizing Cohesity’s unified platform. Enterprises need a new approach to managing their growing data. Legacy storage appliances aren’t able to keep up with the rapid expansion and were not designed to manage data across cloud environments. Cohesity delivers a distributed file system - SpanFS™ - that combines the best of web-scale and enterprise-class capabilities. Join Raj Dutt, Product Marketing at Cohesity, as he discusses how enterprises are simplifying their secondary storage with Cohesity. Learn how you can eliminate and say goodbye to secondary storage silos! Are you struggling to keep up with the growth in data and corresponding storage needs? Are you looking to leverage your on-premises solution but also use the public cloud for use cases such as long-term retention? You’re not alone! The ideal solution allows you to have the best of on-premises and the public cloud for your secondary storage requirements and benefit from both. The Cohesity DataPlatform was built with this design principle in mind and integrates seamlessly with public cloud platforms such as Google Cloud Platform. -Hear how Cohesity and Google customers are benefiting from the joint solution for backup, archival, and disaster recovery in the cloud. Data growth is driving storage complexities. Majority of today’s enterprise secondary storage infrastructure is fragmented and inefficient that contains dark data. Watch this webinar to learn how Cohesity is simplifying file and object storage on a hyperconverged, scale-out solution, and how Manhattan Associates (NASDAQ - MANH) leveraged Cohesity to consolidate their secondary storage workloads on a single platform. The benefits of hybrid cloud are well established. Now customers are looking for a solution that can combine the best of on-premises infrastructure with the public cloud for solving their data management challenges. See first hand how Cohesity delivers a web-scale platform that consolidates all secondary storage and data services onto one unified, efficient solution. Cohesity simplifies data protection, converges NAS and object storage, provides instant access to test/dev copies, and performs in-place searches and analytics - all on a software-defined platform that spans from the edge to the cloud. In 30 minutes, you’ll learn everything you need to know in order to evaluate what Cohesity Data Platform can do for your organization, and how we can help you take back control of your data, from edge to cloud. Cohesity is solving today's secondary data sprawl and simplifying data protection in virtualized environments. Catch this virtualization optimization ecocast to learn how Cohesity simplifies data protection, reduces costs by > 50%, and why we're more than just a backup! Learn more about Cohesity's modern and efficient approach for primary NAS data protection and recovery, using advanced snapshot integration for leading Primary NAS vendors like NetApp, DellEMC Isilon and Pure storage and for generic NAS too. Cohesity delivers the industry’s first hyperconverged secondary storage system for consolidating backup, test/dev, file services, and analytic datasets, onto an infinitely scalable, intelligent data platform. With Cohesity, IT organizations achieve far greater operational efficiency and agility in managing their data assets on-premise and in the cloud. Cohesity counts Credit Acceptance, Cvent, GS1, and Tribune Media among its growing base of enterprise customers. 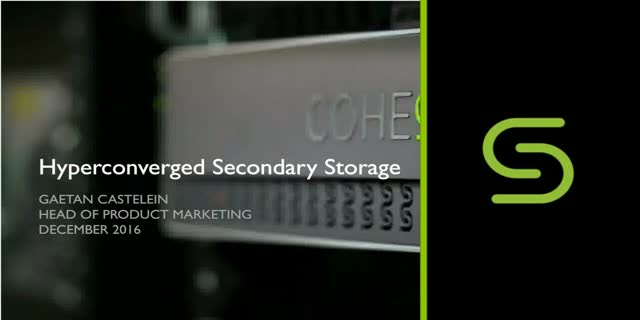 For more information, visit www.cohesity.com. Presented by: Gaetan Castelein, Head of Product Marketing, Cohesity.